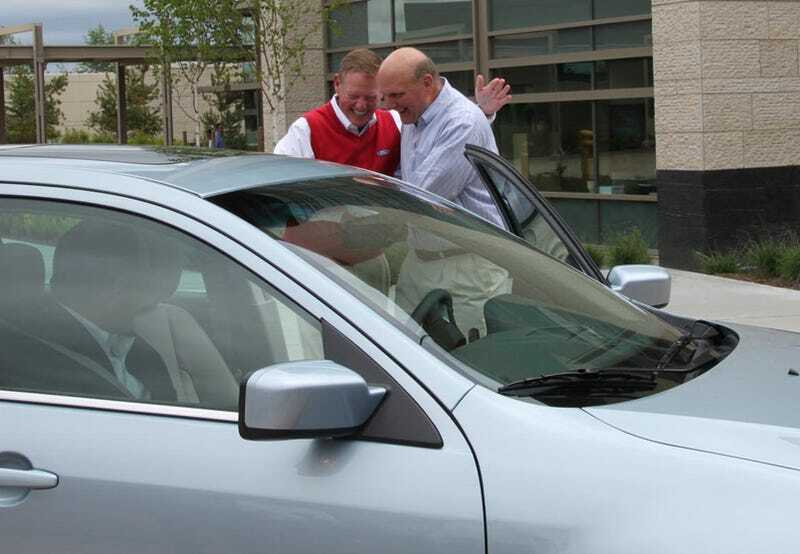 As Ballmer and Mulally toured Microsoft HQ yesterday to tout the SYNC system they met with a Jalopnik reader and MicroFord fanboy in his Mustang. You can guess what happened next. Bwahahaha, was running around MSFT's main campus to go grab some stock 99 cobra springs for the IRS swap I have planned for my beater foxbody this winter. I saw a few familiar heads in a Ford Fusion Hybrid, and so I popped down a gear on my four-speed, and made a raucous noise as I passed them. I just dusted the CEO of my brand-of-choice. That's cool. Almost as cool as Mulally's red, Ford-badged sweater vest.